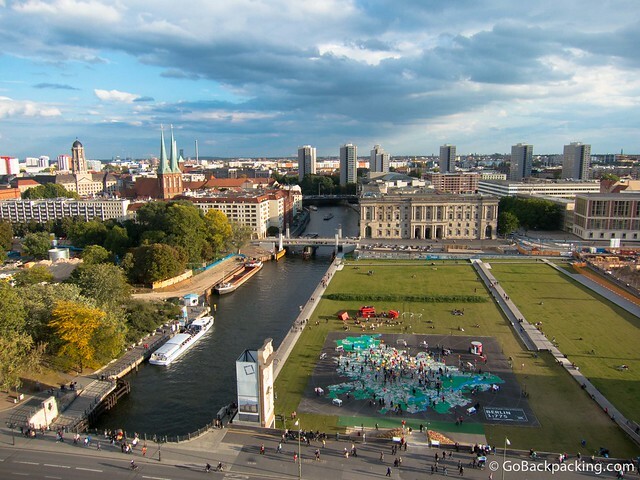 I set out on my first day in Berlin with a folded paper map, and a loose sense of direction. Neither Berlin, nor Germany, had held much appeal for me in the past. It wasn't until I started meeting hundreds of German travelers around the world that I began to become curious about the country and culture. Motivated by Oktoberfest, my first stop in the country had been Munich five days prior. Aside from visiting the fairgrounds, and taking a quick walk to the city center, I hadn't done any sightseeing. In Berlin, the sightseeing opportunities unfolded before me with minimal effort. It's one of those cities where you can head in any direction and find something noteworthy. 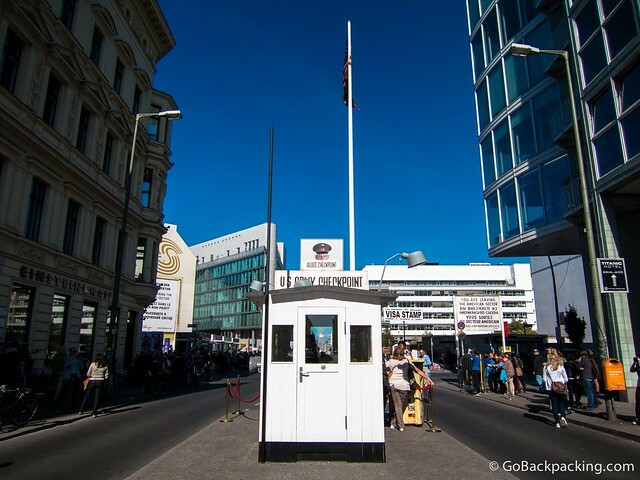 Walking north along Friedrichstraße, I targeted Checkpoint Charlie as my first major sight in a city so filled with history, it'd take months to fully explore. During the Cold War, this American military checkpoint marked the border between West Berlin, which was controlled by the Allies, and Soviet-controlled East Berlin. Today, it's a major stop for all the group tours, as was evident by the number of buses parked nearby. I ducked into the Haus Am Checkpoint Charlie on the same street. The multi-story museum was filled with everything from newspaper clippings to old cars used to smuggle people across the border. The amount of information was overwhelming, and my eyes quickly began to glaze over as I walked through the various rooms. Unless you're a history buff, I'd save your $16 (the cost of adult admission). Exiting the museum, my stomach was grumbling. 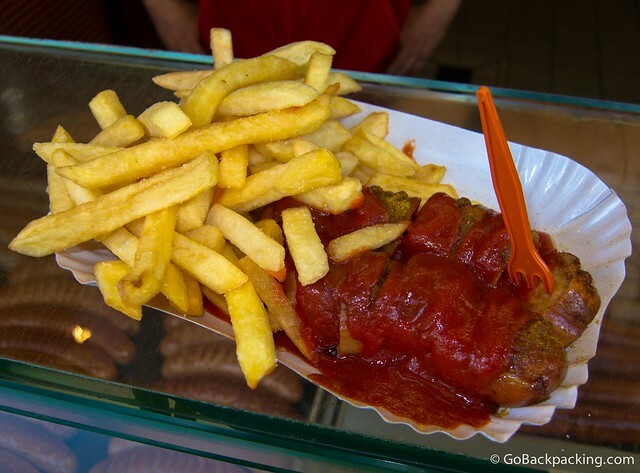 I spotted Checkpoint Curry, a small shop selling one of Germany's most popular fast foods, the currywurst. For $2.60, the fried pork sausage was sliced, seasoned with curry powder, and topped with ketchup. Along with a side of fries, it made a salty but tasty snack. I continued further north along Friedrichstraße until I reached Unter den Linden, the main road which crosses through Berlin's city center from east to west. Hanging a left, I began walking toward the Brandenburg Gate, which was rebuilt in the 18th century. It just so happened that my first day in Berlin was October 3, which is a public holiday known as German Unity Day. Since the fall of the Berlin Wall in 1989, the Brandenburg Gate has come to symbolize both Berlin, and German re-unification. As such, it's the epicenter of festivities for the annual unity celebrations. Behind the gate, a stage was set up where musicians were performing throughout the day, and the street was lined with food and beer vendors for as far as the eye could see. 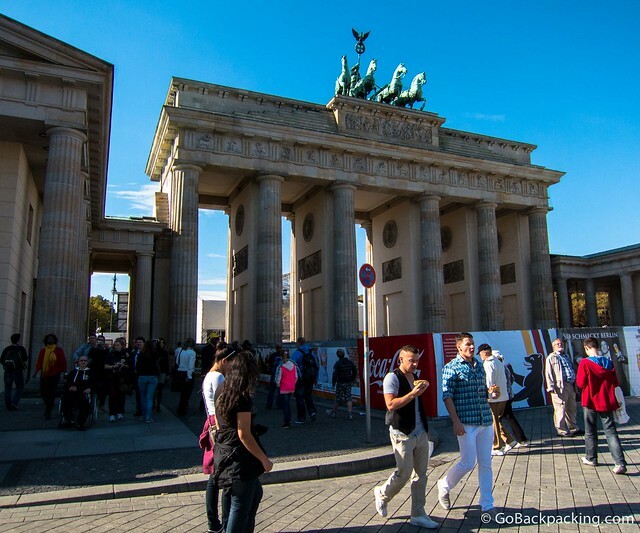 A sea of Germans, in addition to the regular tourists, were out enjoying the weather, Fall colors, and festivities. At the Brandenburg Gate, I hung another left, and walked one block to the Memorial to the Murdered Jews of Europe, which features two parts to explore. 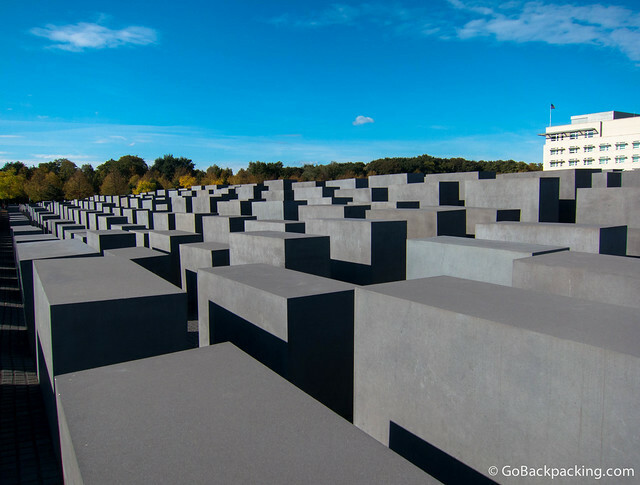 Above ground, is the Field of Stelae consisting of 2,711 concrete slabs (stelaes). Below them is an underground information center, which is free to enter. After visiting the Holocaust memorial, I continued south along Ebertstraße for three blocks until I arrived at Potsdamer Platz, which I recognized from the night before. It was here, amongst modern buildings and shopping centers that I emerged from the Berlin metro after arriving from Munich by train. In the daylight, I was able to see several sections of the Berlin Wall were on display. They presented an interesting contrast to the modern office buildings around them. While it may not seem like much, this would be the only section of the Wall I'd see during my time in Berlin. 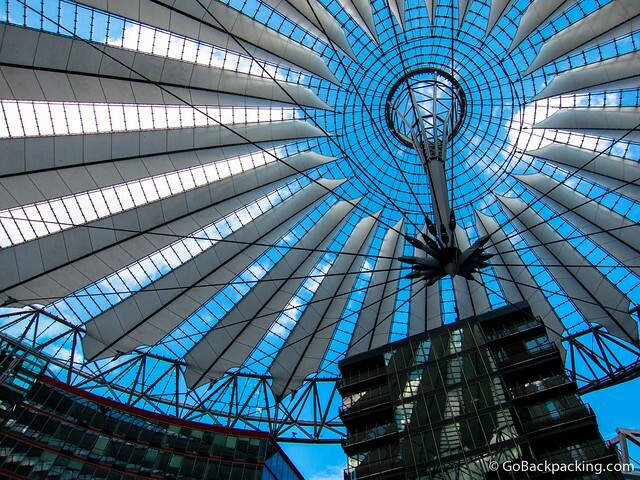 The design of roof at the nearby Sony Center drew me in. The umbrella-like roof shelters an open plaza, surrounded by restaurants and bars. Above the commercial space are apartments, which I imagine are quite costly. The complex also houses a multiplex. I found the space fascinating, and was happy to simply gaze up, and take photos from various angles. 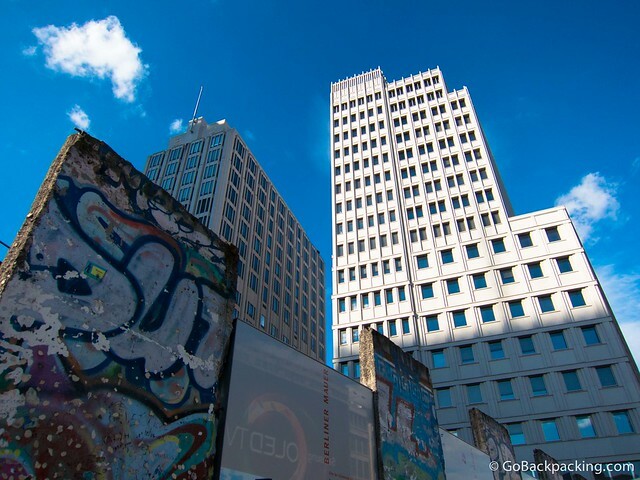 If you're looking for a hotel in Berlin (you can do so on trivago.com), Potsdamer Platz would make the perfect base for both sightseeing, and shopping, while giving you loads of food options within a short walk. From Potsdamer Platz I reversed course, and walked north, back past the Brandenburg Gate to the adjacent Reichstag. The Reighstag is home to the German parliament. An austere and imposing building, it was severely damaged during World War II, and not fully reconstructed and renovated until after German re-unification in 1990. When I first arrived in Munich, it was with mixed emotions. After all, it was Adolf Hitler and Germany that drove to take over Europe, and eliminate the entire Jewish population. Six million Jews died in the Holocaust. I'm Jewish by birth. If I was living in Europe 67 years ago, I would've been put on a train to the concentration camps, or simply killed outright. I'd never thought about that much, until I got to Germany. Walking around Berlin, the sightseeing had helped temper these thoughts. But standing in front of the Reichstag, they filled my mind once again. Thoughts of a bygone war contrasted sharply with the scene before me. In an effort to reconcile them, I tried to stay present in the moment. It was a crisp Autumn day. 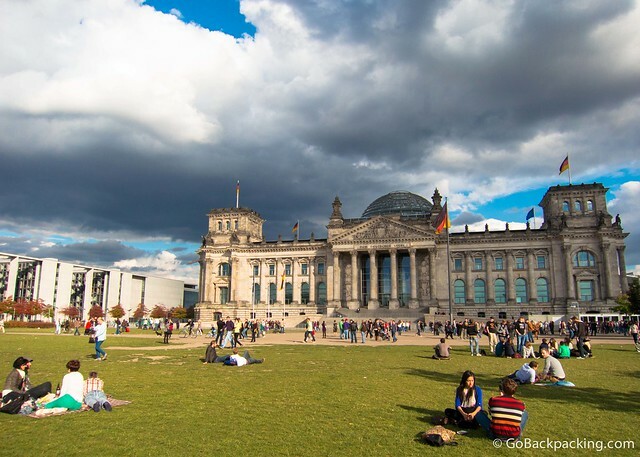 The grass was filled with Germans enjoying a break from work and school, while tourists were busy queuing for a chance to walk around the Reichstag's glass dome. Walking east, Unter den Linden turns into Schloßplatz, which crosses an island in the Kupfergraben River. 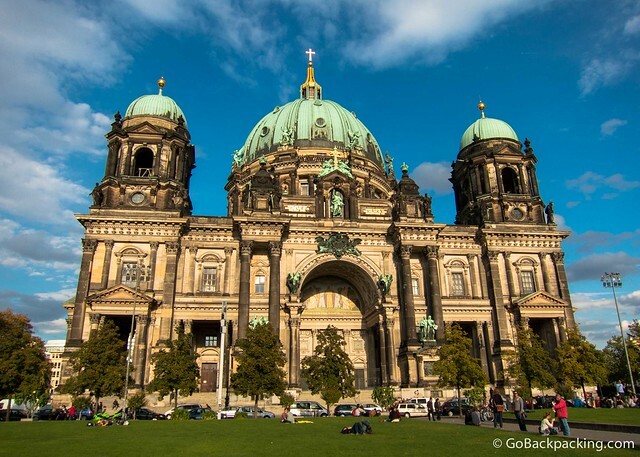 On that island stands the stately Berliner Dom, or Berlin Cathedral. As I approached it through a grassy square, the sun emerged from behind the clouds and illuminated the entire front facade. Bathed in an unexpected splash of warm natural light, I made sure to get a few photos, before buying a $9 ticket to visit the roof. A musical group was rehearsing in the cavernous interior, while tourists listened and watched. Atop the dome, you're treated to 360-degree views of the city. 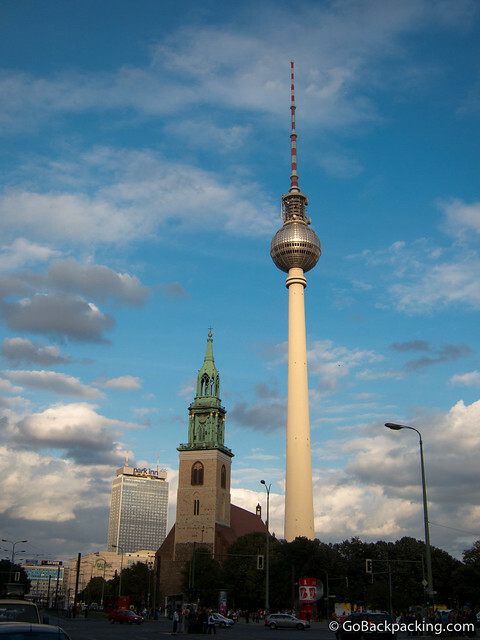 Further east past the cathedral is the Fernsehturm TV Tower, which stands at 679 feet (207 meters). I shelled out $16 for a ticket, but after waiting around for a half hour, I realized it would be several hours more before my number gained me access to the top. Thankfully, I'm not the only impatient tourist, because I was able to wait in line again, and get a full refund. It was at this point, with the sun setting, that I felt completely worn out from my first day walking Berlin. Fully satisfied with how much I'd seen in a single afternoon, I hopped a metro train back toward my accommodation, and called it a night. Disclosure: This was a sponsored post, written by Dave. Our walk of Berlin looked the same – I liked that it’s so walkable. Checkpoint Charlie was interesting even though it’s pretty touristy! I love Berlin and go at least once a year. It never gets old for me. You went to a lot of the great places!